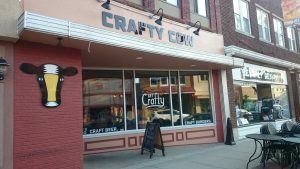 When we heard there was a new ice cream shop opening in downtown Farmington, we thought, “Cool.” Then we heard it was some sort of “craft creamery”, and then thought “Oh, that sounds very cool.” Then we heard they were going to be serving special unique dessert creations. It kept getting more unique. Finally we heard they were going to be serving craft cocktails, and craft beer. Woo-hoo! The background story was that Brown Dog Creamery in Northville was looking to expand operations and add another location to expand their ice cream production. They found out about the Farmington site and thought it would be a good location. 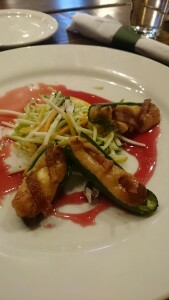 Then they heard a liquor license was available and that got them thinking of something new and unique. We had stopped by a couple times during the afternoon for the ice cream and it was awesome. On a recent Friday night we decided to check out the “bar” side of things. There were a lot of folks in there around 10:00 PM as we took a seat at the bar. The menu had an impressive/tempting array of hot appetizers, but we’d already eaten so we skipped that. 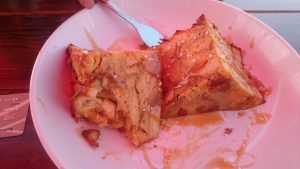 Then, in addition to their array of fresh-made ice creams, they had several delicious-sounding desserts. We chose one made of cider mill donuts, caramel, and fresh whipped cream. They didn’t have a massive draft list, but the 8 they had were all good craft- most of them Michigan. There was a lively feel in the place, and they had good music playing, almost felt like we were in a nightclub- but not in an annoying way. It was a very refreshing and different place to hang out in the evening. We’ll be back. 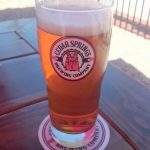 I attended a seminar a few months back, where the owner of Cedar Springs Brewery talked about his path towards opening his own brewery. 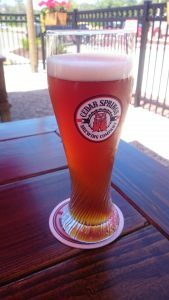 It was a very interesting story that involved time working in a brewery in Germany and wanting to bring some of that German beer hall feeling (and beer) to Michigan. Following that, sampling some of their beers at the 2016 MI Winter Beer Festival for the first time, they were outstanding. I knew I had to make a visit. So, on the way out to the west side of the state for some family vacation time, we made a detour north of I-96 and traveled to the small town of Cedar Springs just prior to the 4th of July. 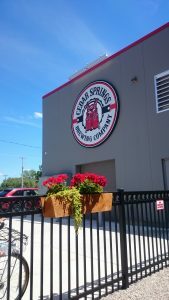 Cedar Springs is a small town, and driving past all the closed stores and quiet main street on Sunday afternoon, I was concerned we’d find the brewery closed. But not so. What I did find was the lack of cars on the road was more than made up by the number of bikes on the nearby “rails to trails” bike path that detoured over for some food and drink. Cedar Springs has a big room in the front of the building with numerous tables and grand open-air windows facing the main street, but also a very nice patio area out back with giant picnic tables with nice big umbrellas to shade you from the sun’s rays. We sat out back and ordered beers and food as it was an awesome Michigan summer day with lots of blue sky, sun, and temperatures just shy of the point where you really start to sweat. While sitting there, we saw the constant flow of bike traffic in and out. It ranged from people in their bike Speedo shorts and “competition” jerseys, to families with tag-along bike attachments for their youngsters, and all ages/sizes in between. 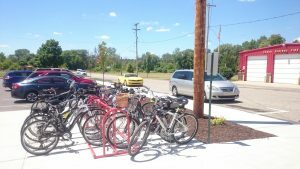 In all seriousness, the bike rack was at capacity, while the parking lot still had tons of open spaces. 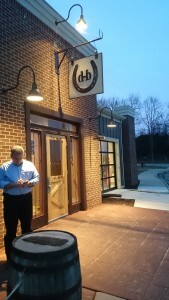 The food was very good (particularly the pretzel appetizer and the bread pudding desert), and the beers very good as well. Their menu is split between American choices (food and beers) and German choices (food and beer). We opted for the German fare for food and beer. 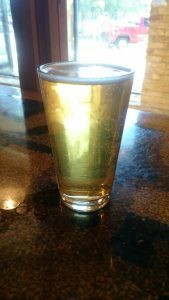 The beer was really great with a nice malt taste, but very clean and light flavor to go down well. 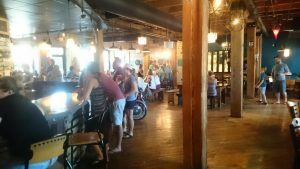 Last summer we were in Grand Haven and I tried to find Odd Side Ales taproom. Even with GPS and Google Maps, I couldn’t find it. I mean I didn’t try my hardest, as I was exploring with my young children, but when I looked down the street where I thought it should be I didn’t see anything. This year, I was more determined. I pressed on down the side street even though it didn’t look like anything was there. As I got halfway down the block, I noticed a non-descript sign above the door into a building and a small outdoor fenced in patio. I found it. Inside, there is a very homey, welcoming spot. Tables of all sorts and sizes, and a giant L-shaped bar. We made our way in and surveyed the sizable tap menu to make choices. Although I’d generally consider myself a fan of Odd Side Ales, I can’t really tell you the last time I bought a 6-pack of something of theirs. 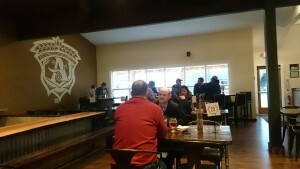 But in the taproom I tried a few different things and was impressed. There was an amazing IPA (which I took notes from the menu on what hops were in it for future recipe creation), and a mediocre lager. 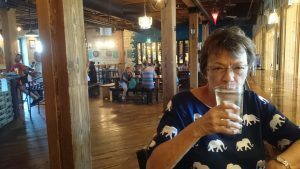 My mom tried the cinnamon cider and it was really nice. Tasted like drinking apple pie. Grand Haven as a beach town, and it being summer, there were a lot of families here. Although the taproom serves no food (minimal snack options), they did have their own root beer on tap. And the overall feel and atmosphere was very laid back and welcoming. No one was upset to see a table with a bunch of kids next to them, and kids seemed just content to come in out of the sun and sand and were content even without TVs, video games, or anything obvious to entertain them. 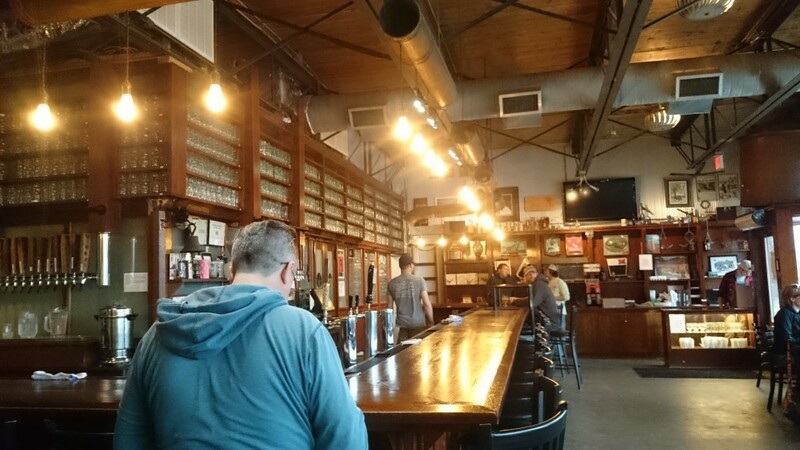 Very cool place and worth it for the atmosphere, and the beers were really good. Now that I know where to find it, I’ll definitely be back! I came to Oconomowoc, WI to visit U-Brew-U as research for one my stories I’m working on. The internet told me there was a good beer bar in town so I checked it out after getting settled into my hotel. 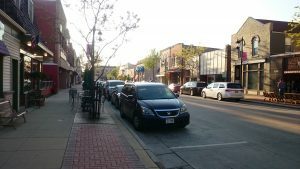 The downtown area of Oconomowoc was quite pleasant and scenic, I could easily imagine convincing the wife this was a great place to stroll around. 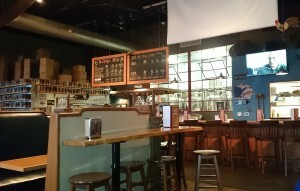 Inside, the Crafty Cow was fairly large, with a long bar and lots of table seating stretching way back. They had about 20 different things on tap, all of them Midwest craft beers. Several of them were Bell’s, so I of course skipped over those to find something interesting that I can’t get back in Michigan. I quickly found 4 that I was curious about so that rounded out my sampler. 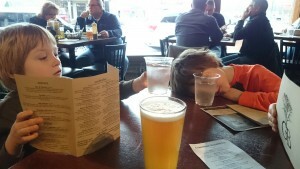 The beers were all good, some more than others. 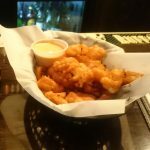 The Crafty Cow specializes in deep-fried cheese curds. I thought this sounded cool, so ordered the “cheese curd of the day” which had a Sriracha-sauce breading, and Sriracha-sauce creamy dip. Holy cow, this was amazing. I’ve had cheese curds before, and liking cheese, I enjoy their different “rubbery” texture. But bread them and deep fry them and lookout. You still got a sense of the curd texture, but it was softened by the heat and they were delicious. I must’ve eaten about 3/4 pound block of cheese wrapped up in this delectable delivery system. I had a burger too (so I didn’t just have a dinner of cheese curd), and it was likewise awesome. Altogether, this place was great. 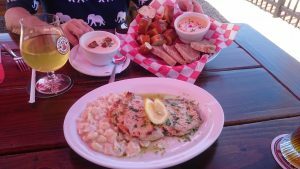 Great location in a nice downtown area, good-sized place with friendly staff and great beer selection, and yes, the food. On a recent trip to Chicago with my family, with 2 young boys, I was doing some pre-trip research and looking for a suitable restaurant to take my young picky eaters. 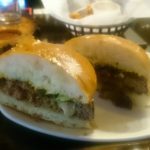 I came across a review of Roots Pizzeria. Pizza is on the short list of accepted foods of the highly refined palates of my youngsters. So when I saw this place listed as family friendly- AND it catered to craft beer, I was sold. The neighborhood seemed like it was on the edge of a slightly dodgy area (bars & metal grates over storefronts, business signs hand-painted on building walls, etc. ), but as we went down the street there started to be hidden gems mixed in. Roots Pizzeria was one of these. Walking in, you immediately felt relaxed as some funky music floated out and the subdued hub-bub of happy conversations at the tables. There was a giant oval bar in the center of the floorplan, and there were numerous C-shaped booths along the outside edge of the floor. The booths were raised up on platforms to give a sort of commanding view over the room, rock-style-like. The pizza was out of this world. The crust was amazing. Supposedly they use some mix of malt in the crust. I don’t know what it was, but it was decidedly different and delicious. We ordered half of the pizza with some special goat cheese, which was also phenomennal. I don’t know what was special about the sauce, but yes, it was great too. Enough about the pizza, Roots specializes in Great Lakes states beers (MN, WI, IL, IN, OH, MI). 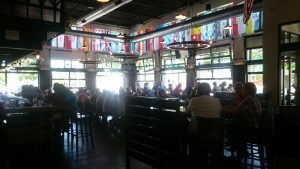 Supposedly over 100 different Midwest beers amongst an impressive draft list, plus bottles and cans. After fighting my way through ridiculous Chicago traffic, I thoroughly enjoyed working my way through the draft list of Midwest beers not available in Michigan. As icing on the cake, Roots set up a giant window with a view into the pizza-making kitchen with a small bench for young viewers to stand in and peer in on the process. And my young one was thoroughly fascinated and stood and studied the process for a long time. 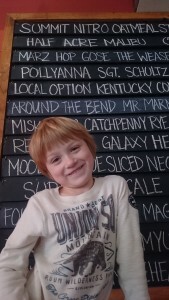 Roots is great for beer, awesome for pizza, great for kids, and an amazing atmosphere overall. 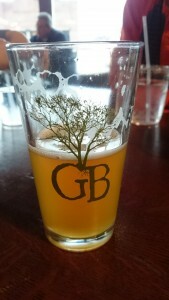 I’d seen Greenbush Brewery taproom in The Michigan Beer Film, and I’ll admit that it lifted the brewery to an elevated state in my mind. I’ve had their beers, and am a big fan of Dunegras and Star Chicken Shotgun IPAs. So with a planned family trip to Chicago, a layover in Sawyer, MI in the Southwest corner of the state sounded like a great idea. 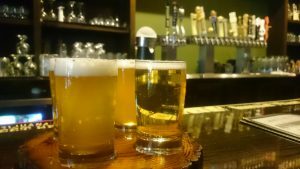 With a $50/night Super 8 hotel a stone’s throw from I-94, which in turn is walking distance to Greenbush’s taproom, was a winning combination. It was a family vacation, so my wife & I were travelling with our 2 young boys. We got to town for dinner around 7 PM on a Thursday night. 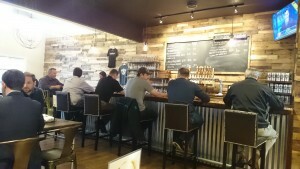 The taproom was smaller than I had anticipated based on The Beer Film portrayal. But it was still a nice size with a nice open feel with high ceilings and large windows facing the main street. Right away I could tell it was family-friendly as about 1/2 of the tables had kids of some age at them. 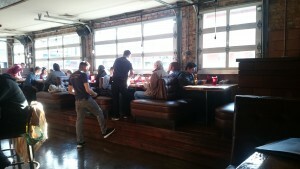 In addition they had a small Lego table set up in the taproom with piles of Lego’s for creative minds. 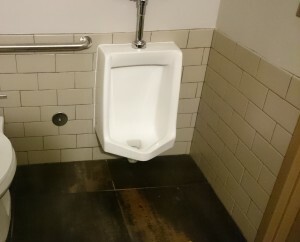 And the men’s bathroom had the obligatory low-height urinals that fathers of young boys like me appreciate. The food menu wasn’t extensive, but it had enough. Honing in on the pulled pork, which is always a BBQ favorite, we also went for the beef brisket. The Mac ‘n cheese was pretty good, and the pulled pork not that special- but the beef brisket was out of this world amazing. It was so good, it seemed like they should have been famous for smoked brisket sandwiches, and offered beer on the side. The beers were good, as in the bottle, and the atmosphere was great. If the place was 30 minute drive instead of a 3 hour drive from my house, I’d be there all the time. With my family! 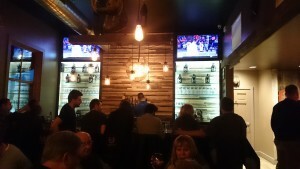 Draught Horse Brewing has a nice set-up. In a spot on its own surrounded by some woods it has a kind of peaceful feeling even though it’s just West of a busy business center area at a major I-96 exit. We went at night to try some beers on a Thursday night and found it to be quite busy. They had what looked like a very interesting food menu, but they also had a great list of beers on tap. There were many that I wanted to try so it was tough to figure out a starting place. A wide range of styles to appeal to all beer drinkers for sure. The beers were all very well made with great flavors. I had some awesome IPAs and Pale Ales with some awesome fruity hops. One thing that stood out was this place was very family friendly. 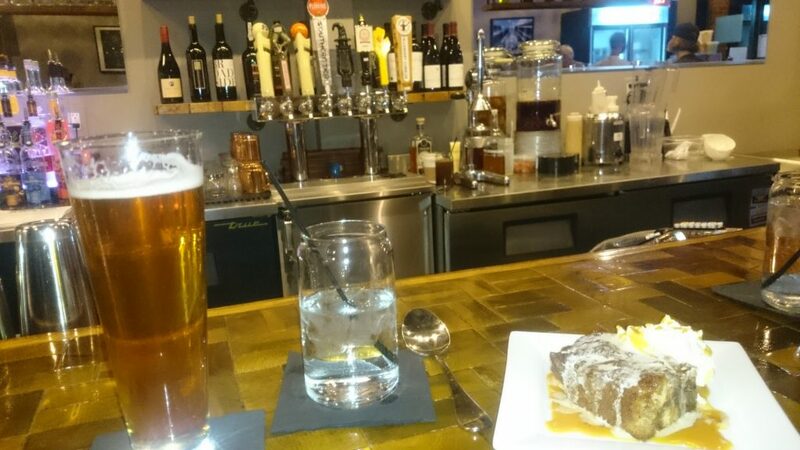 As a parent with 2 young boys, it’s nice finding a place that welcomes kids and doesn’t make you feel like a social pariah for wanting to have a meal at a brewery with your family. Heck, they even have a special day of the week when kids meals are discounted. I didn’t have the boys with me the night we visited, but there were a lot of young ones sprinkled throughout. One thing that sealed it in my mind that this was a place that definitely had kids in mind was the boys bathroom. Toilet & urinal as usual, but the urinal was nice and low for easy access. It may seem trivial, but as a father of young boys, a urinal that can be reached is always a sign of family-friendliness I’ve found. I’d been to Ascension before for beers and was quite impressed, so we went back on a Thursday night for dinner and beer. Although you’d never notice the brewery if you were driving down Grand River, as it’s tucked into the corner of a unique strip mall, if you follow your GPS you’ll be fine. Walking into the place it feels bright, cheerful and relaxed. For some reason it feels like walking into some kind of vacation resort place in Florida to me. The place is set up with mostly a bunch of long tables with benches for community seating (they have signs up encouraging you to sit next to someone you don’t know and strike up conversation), but they also have two bars and a few high top tables. The food menu is really good with very unique appetizers, great sandwiches, smoked meat dish of the day, and salads that even sound interesting to someone not ordering salads. 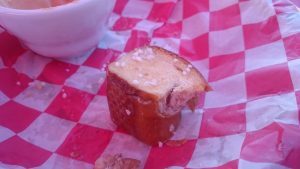 that was topped/filled with a fluffy mix of peanut butter and cheddar cheese and dressed with a pomegranate sauce. Not only did it look super fancy, it was delicious. I went for the smoked meat of the day, which was a kielbassa which tasted great but didn’t look that appealing on the plate. The side of mac ‘n cheese it came with was amazing. Both beers I had were good. 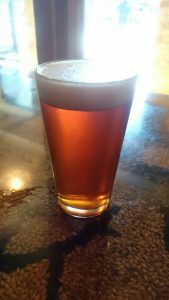 I had a Wheat IPA that was clean tasting, but not super-exciting, and their house IPA was quite tasty. It’s definitely a good place for food and beers. Almost like a kid on Christmas morning, I sprang out of bed and hurried about my preparations to get out the door Saturday morning on February 27th. Of course everything was packed the night before, and my clothes were laid out. 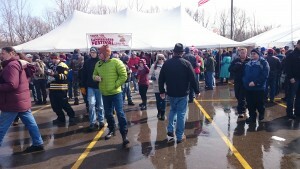 It was the 11th annual Michigan Brewer’s Guild Winter Beer Festival, and I’d been to 9 or 10 of them. Each one I look forward to for at least half of the year. 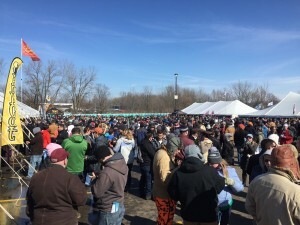 It’s probably the one thing that makes winter bearable when it starts in Nov/Dec is that I know at the end of February I’ll be making the roadtrip out to Grand Rapids for another Winter Beer Fest. I attempted to check-in to the hotel at about 9:50am to which they simply replied that they don’t guarantee rooms until 3:00pm, so I could come back later and check. A quick brunch at Burger King to fill the stomach, then Kevin and I boarded the shuttle bus from the Holiday Inn and made the trek up to the baseball field north of town. As Brewer’s Guild Enthusiast members (annual paid membership), not only do we get access to buy our festival tickets a couple of days early and avoid the mad rush, but we get into the festival an hour early. 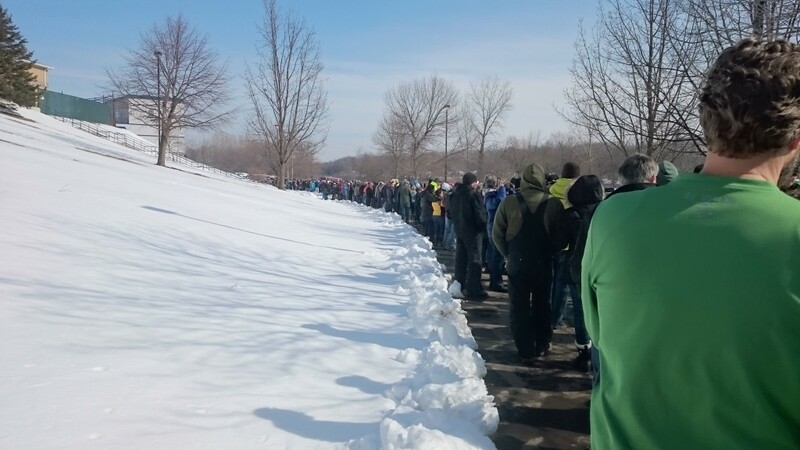 We got there about 11:30 and there were already 2 lines formed. One for the enthusiasts (gates open at 12:00), and one for the general admission (gates at 1:00 pm). As we kept walking and walking we were blown away at how long the line was for the enthusiasts. There were probably 500 – 600 people in front of us, out of the total 6,500 people that would be attending that day. 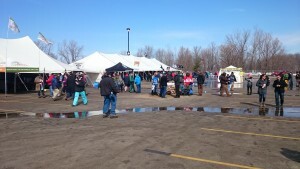 Luckily they did a good job of pre-checking IDs, so once Noon came along, the line zipped right along. Being in the hour early is nice. The lines are really short and it doesn’t feel as chaotic as you figure out where to go. For the first hour, we prioritized the places we wanted to go that we knew would be really popular once the general admission gates opened at 1:00 so we could get those out of the way. And as the clock struck 1:00, you could see and feel the hum of the crowd as people started pouring in, scrambling to get to their favorites. The weather was quite nice and we felt a bit spoiled. Some of these in past years have been quite cold, which carries its own charm from a “toughing it out” perspective, but this year was sunny with temperatures in the mid-40s. This of course was great because fumbling around for tokens, trying to hold your sample cup, trying to keep track of which beers you tried and which ones you liked, all while holding gloves is a real pain. With the weather not requiring gloves, it made it all manageable. Another excellent tool was the App BeerFestList, which partnered up with the Brewer’s Guild to have the complete brewery listing and each beer the brewery had on hand. So not only could you scroll through the listings to see what you wanted to try, but you could give it a 1-5 star rating to help your fuzzy memory the next day as to which ones really were your favorites (my ratings below). 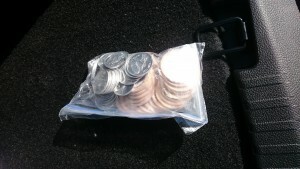 And this year, I finally remembered to bring my leftover tokens from festivals past, so I felt no pressure to drop a token in every box and not be paranoid of running out. We took a cab back as we had big plans for a night on the town afterwards and we wanted to get to the infamous HopCat before it was too full. Many memories of the mac ‘n cheese with chorizo and jalapenos has a strong pull… Of course we got there and it was a 30 minute wait. 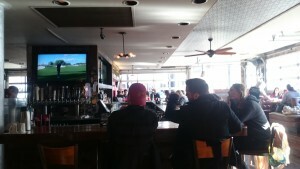 After walking around and striking out at other joints that had an equally long wait, we settled in for pizza and beers. But the effects of what seemed to be an unusually high number of high-ABV beer samples were wearing on us and after a meager attempt to enjoy Founders, we packed it in and headed back to the room for an early bedtime. Overall, the beer quality was really good this year, and there were a lot of beers Kevin & I were both quite impressed by. 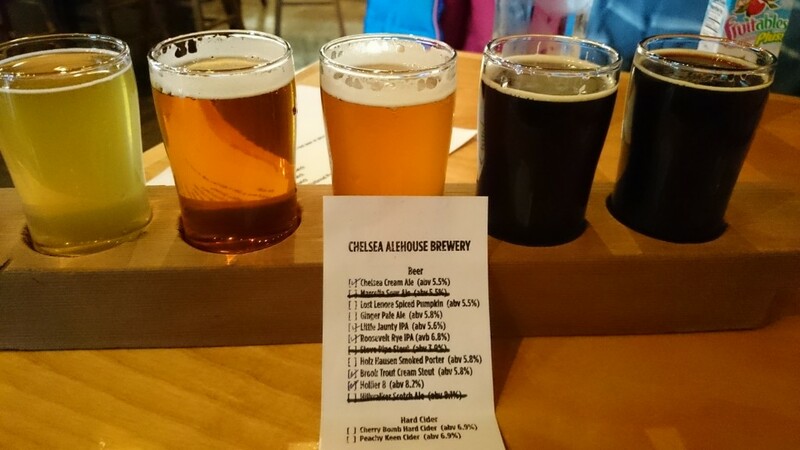 The beers from Cedar Springs were amazing, and we actually went back 3 times for refills of their Marzen. Another amazing one, that for me just barely edged out the Marzen was Beards Brewery PomeGalactic, an amazing pale ale brewed with sweet Galactic hops. 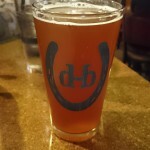 Rounding out my top list of stand-out beers was Wolverine State Brewing High n’ Dry Rye. 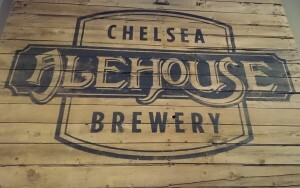 We went out to Chelsea for an afternoon of walking around the downtown shops. There’s plenty to see there to keep the whole family entertained, as well as the Purple Rose Theater which is a cool up-close setting to see a play. So once you’ve made an excuse to go out to Chelsea with the family, here’s a great place to suggest for lunch (or dinner). We went there on a Sunday afternoon. We found that some of the shops are closed on Sunday, so maybe if you plan a trip, plan for a non-Sunday. The Alehouse is decent sized place. It’s located just at the north end of the small downtown, nice walking distance if you park on Main by the shops. It’s in a quasi strip mall/industrial park, so nothing that exciting from the outside. But inside is a very nice space. High ceilings, warm colors, and lots of seating options (bar seats, small booths, big booths, small tables, or pull lots of tables together for a big group). There was a small stage in one corner and based on the flyers posted around, they have live music from time to time. The lunch menu had a good variety of sandwiches, and there was a decent kids menu with about 5 different choices. We all had something different, and they all were delicious. The pesto chicken bacon sandwich I had was quite amazingly tasty. With a number of beers I wanted to try, I went for the taster flight that let me choose from 5 of the 8 different beers or 2 ciders they had on tap. They also had a collection of wines from a Michigan winery (can’t remember which one). Of the 5 beers I had, they were all pretty good with the exception of the Black IPA, which I didn’t really care for. The others seemed good for their style, and a couple of them were quite delicious (see my ratings/comments here). This is definitely worth a return visit. With the atmosphere and high ceilings, it worked out very well with the kids. They could be a bit noisy and rambunctious without disturbing other people around, which meant as parents we could relax and just enjoy the place.